Practicing downhill running is often overlooked by runners because it feels so easy. However, if done properly, it can provide great benefits and prevent serious long term damage. Running downhill can make you sore and tired because of the stress placed on your quads and the tendons and ligaments in the ankles, knees and lower legs. On the other hand, it stimulates muscle growth and builds strength making you a stronger runner. If you are going to be running downhill for a long distance and you haven't properly trained for it, you could experience significant damage to your muscle fibers. You may also experience fatigue and pain and then delayed-onset muscle soreness (DOMS) in the days that follow. Many marathoners have suffered from DOMS when they haven't properly trained for races that include a lot of running down hills such as the Boston Marathon. To gain the benefits of running downhill and to protect yourself from muscle damage, you need to practice running down hills. Downhill running is an unusual movement that cannot be duplicated. Running or walking downstairs is not the same movement so you need to find a hill and practice running down it. Start with a gradual slope and do some repeats. Start with 2 or 3 only and gradually increase reps. Allow 2-3 minutes recovery time between reps. These workouts should only be done every 2 or 3 weeks as recovery time is essential. If you live in an area that is very flat, try running down exit ramps or the ramps in a multi-storey car park. To make the most of your downhill practice, ensure you practice good running form. Have an upright posture and resist the natural tendency to lean back. Don't look at your feet. Gaze 10-15 meters ahead. Keep a space between your chin and chest--about the size of a grapefruit. Lean from the ankles. Think: nose over toes. Keep knees slightly bent to soften impact and put more spring in your step. Shorten stride and quicken cadence to reduce impact. Keep feet parallel to ground to ensure a solid landing and reduce impact. Engage core--your abs and glutes to maintain control and your form as you accelerate downhill. If you love running down hills as most runners do, you can make them work to your advantage if you do them properly. The fear of falling can make you run downhill slower, but practicing with the proper form will help you lose the fear so you can run faster with less impact. A great way to improve race times. So what about you? 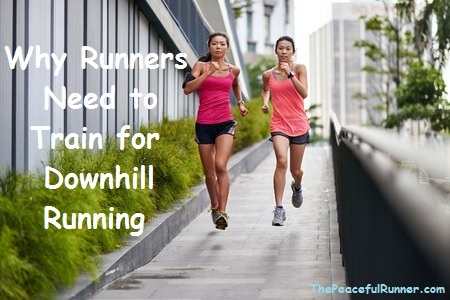 Do you practice downhill running? What are your favorite workouts? Please share in the comments below.